Indoor plants bring the beauty of nature into your home. They are pleasing to the eye and make wonderful décor. But they offer another benefit that is invisible to the eye. Plants are natural air purifiers. They absorb air pollutants and release fresh air into the atmosphere. 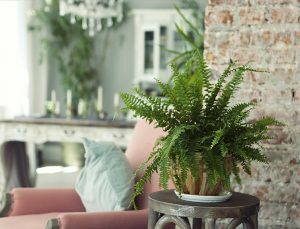 While houseplants can help to keep your indoor air clean, they are no replacement for regular maintenance and filter changes to avoid breakdowns and expensive AC repair in Greensboro. How Do Plants Purify the Air in your Home? The leaves of plants are naturally porous. The pours are designed to absorb gases, allowing photosynthesis to take place. Flashback to your middle school science class and you may remember that photosynthesis is the process by which plants convert sunlight and carbon dioxide into energy. The byproduct of this process is oxygen, which the plant releases into the atmosphere. 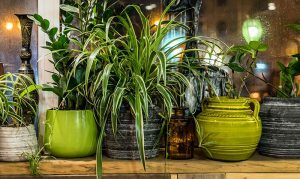 Therefore, your houseplants are taking the carbon dioxide out of the air and adding oxygen to the air, creating fresh new air in your home constantly. Besides just carbon dioxide, plants remove all sorts of hazardous gases from the air. Some of the most harmful chemicals in the air are called VOCs (Volatile Organic Compounds). VOCs, like Benzene, are found in fabric, plastic, paint, cigarette smoke, and some pesticides. If you’ve recently purchased new carpet or had remodeling done, you might experience headaches or dizziness from the fumes these products exude. Formaldehyde is another VOC found in some cleaners, soaps, and cosmetics. Your houseplants can remove these chemicals from the air, making your inside air much healthier. Air pollutants cause a number of health issues from mild conditions like allergies and asthma to more serious health problems like pneumonia and emphysema. You may not even be aware that your indoor air is polluted, as the symptoms can come on gradually and some health issues don’t manifest until many years after exposure. What Are the Best Houseplants for Better Air Quality? If pure indoor air is a high priority for you, consider installing an air purification system. Many products are designed to work with your HVAC (heating, ventilation, and air conditioning) system to filter more toxins from the air than your regular intake vent filters do. Some air purification systems are designed to create new clean air, much like plants do. Contact Berico, the premier company for AC repair in Greensboro, to ask about air purification products. A properly functioning HVAC system is an important element of keeping indoor air clean. Replacing your filters regularly keeps dust and other particles out of your system. Regular maintenance includes filter replacement as well as system cleaning that removes other dirt and debris before the air comes out of your vents. It also ensures that your air conditioner and furnace are operating and venting properly. Call Berico to schedule an AC tune-up and filter change to keep your indoor air pure and clean: (336) 273-8663.